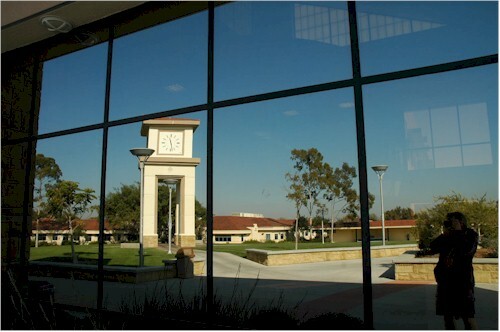 I took this photo into the library window at MiraCosta College. Not much visible inside, but the reflection is nice. You can see some lights on the first floor ceiling and the first and second floor windows across the building, but not much else inside. That's me holding the camera focusing on the clock tower in the reflection. I'll be teaching off in the distance (the reflected distance) on Monday and Wednesday afternoons.